Not many people know that the world’s largest amphora site is in the very heart of Pula. Today they are still in the area that resembles a construction site in Kandlerova Street in Pula. Over two thousand amphorae have been discovered only a few steps away from the Arena. There is also a permanent exhibition of amphorae in the underground area of Pula’s amphitheater. 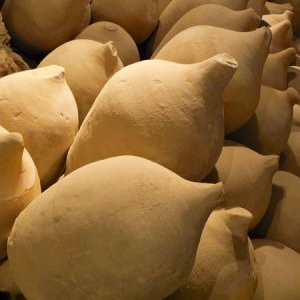 Amphorae are specific vessels that were used for storing and transporting olive oil, wine, salted fish and preserved fruit. They were also used for building as construction and insulating material, as well as for filling in swampy areas. The characteristic Istrian amphora has a very pronounced egg-shaped body with long neck narrower than the body and small handles on opposite sides.